It's been over a year since Ady An got married to Chen Ronglian in Hawaii, but before their big day, there were reports claiming that Ady An had cheated on him and that their wedding had been called off. 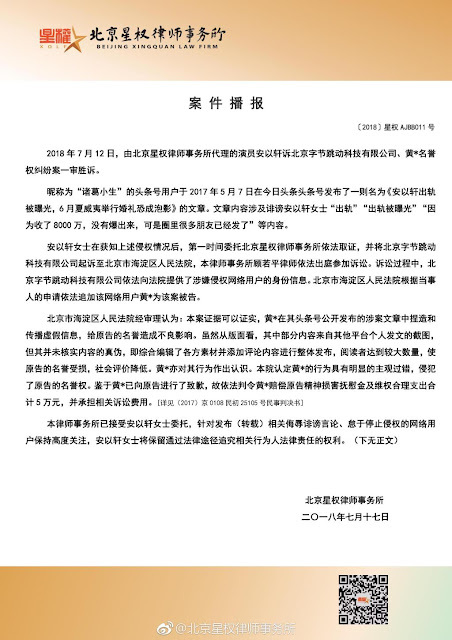 Furthermore, the truth was allegedly covered up due to payments made amounting to RMB 80 million. On July 17, 2018, Ady An's lawyers issued a statement to say that Ady An has won the libel suit. It has been proven that the rumors were mere fabrications to malign the actress. The accused (a certain Huang) has already written a letter of apology. Huang is also required to pay RMB 50,000 in damages including legal costs. Spreading false rumors has become so easy in this day and age that we seem to be hearing about lawsuits more often than before. It's nice to see an instance where justice is served. Meanwhile, Ady An and hubby were just in Turkey last month celebrating their one year wedding anniversary.